Once again an independent auditor has given the Water District an unqualified clean opinion and indicated the District is financially strong. The annual audit for Fiscal Year 2013 was presented to the Board of Directors by Allan Johnston, CPA, who conducted the detailed audit of financial statements. Total water demand in 2013 was 7.9 billion gallons. Of that 53% was drinking water, 27% was industrial treated water and 20% was untreated or "raw" water used by industry. The District serves large industrial process plants including Sherwin Alumina, Occidental Chemical Corp., Dupont, Air Liquide, Ingleside Cogeneration and Gregory Power Partners. The District maintains an unrestricted fund balance that will be used for future projects, any large unexpected expense and for rate smoothing. While it has been three decades since the last major hurricane hit the Water District service area, it is necessary to be prepared for the potential of major economic disruption, including reduced revenue from water sales, in the wake of a severe storm. Business-type activities increased the San Patricio Municipal Water District’s net assets by $1,680,759. The District’s additional revenues were due to settlement of a lengthy dispute. After realizing that City of Corpus Christi was including inside city limit storm water charges in the out of city limit treated water rates, the District requested that the City remove the storm water charges from the District’s treated water rate. The City agreed to undergo an extensive rate study to determine which charges were appropriate. The rate study went on for several years and the City continued charging storm water in the District’s treated water rate. In 2007, the District began deducting the amount the City consultant claimed was the storm water portion from our treated water invoices. The District recorded these funds, $737,650, as a reserve in the liabilities of the District until such time as an agreement could be reached between the City and the District. In 2008, the District joined South Texas Water Authority in filing a lawsuit against the City of Corpus Christi to recover past storm water charges. In 2013, a settlement between the three parties was reached. The District received a cash payment of $1,997,334 and a relief of debt which released the $737,650 withheld liability for a total recovery of storm water charges in the amount of $2,734,984. These funds became part of the unrestricted fund balance of $9.4 million. At the end of 2013 the District had long-term bond debt of $42.5 million including revenue bonds issues in 1998, 2006 and 2009 to fund major construction projects. Bond debt is paid off through future revenue from water sales. The Water District is a "cost of service" entity, meaning that customers are charged water rates based on the total cost of operations, water purchases and debt service. 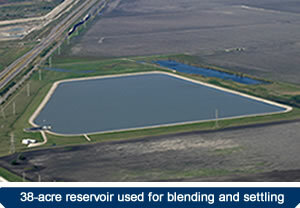 The District purchases raw water from the Nueces River and Lake Texana through contracts with the City of Corpus Christi which manages the regional surface water supply system.